There’s been a lot of talk and (over)analysis over Yankees captain Derek Jeter, who is hanging up his pinstripes Sunday and playing his last home game at Yankee Stadium on Thursday, September 25. To his credit, Keith Olbermann has a great (and hilarious) Jeter rant here. I won’t call it anti-Jeter, but perhaps anti-commercialized or anti the “coronation” of Jeter. 1. His batting averages in the 1998, 1999, 2000, 2003, and 2009 World Series were stellar. Olbermann talks about Jeter’s decline and how his numbers weren’t all that impressive throughout his career. Jeter’s batting average in those five World Series’ (four of which were won by the Yankees) were: .353, .353, .409, .346, and .407. Those are pretty stellar numbers. Granted, Jeter was hitting with better Yankee teams back during 1998 – 2000, but the numbers are solid no matter how you slice it. Were there better baseball players than Jeter? Of course. But when push came to shove, Jeter performed during those World Series games at star levels. 2. Jeter is the first and only Yankee to have 3,000 hits. This to me is paramount in terms of baseball accomplishments. It’s amazing to think that Yankee greats like Ruth, DiMaggio, Gehrig, Mantle, and Bernie Williams never had a chance to get to 3,000 hits. In the era of free agency, it’s not very likely that another Yankee will have 3,000 hits all with the Yankees. That’s a pretty impressive milestone, especially since only 28 baseball players have had 3,000 or more hits in their careers. 3. 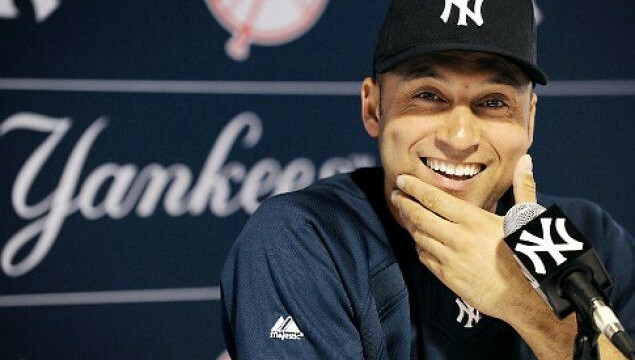 Derek Jeter has raised millions for charity. You need to respect a guy who’s raised money for charity, right? Jeter’s foundation has raised millions of dollars for his charitable foundation. 4. Jeter didn’t cheat…at baseball, at least. Okay, I don’t know Jeter personally (obviously). But from all accounts, he seems like a decent guy. He also came up during the waning of the “Steroid Era,” but he didn’t shoot up. Do we know for certain that he didn’t do steroids or other PEDs? No. But it’s pretty close to certain that he didn’t. 5. Jeter sets a pretty high standard for professional athletes. In the day and age when NFL players are being arrested in droves for assault and related crimes, isn’t it refreshing to see a high-paid athlete who isn’t getting in trouble? I’d rather read about Jeter recording Gatorade commercials in the Bronx than him beating a kid, to be honest. Let’s not forget about what Jeter has done for New York City post-9/11, too (despite what Bobby Valentine thinks). 6. Free markets are better markets. Wait, isn’t that usually your concluding line, Mike? Yes, yes it is. It’s also applicable for Jeter. Yes, he’s entered into an arrangement with Steiner Sports to sell memorabilia at reasonable/high/outrageous prices (depending on your perspective and your allegiance). So what? Is anyone forcing you to buy the Derek Jeter key chain, or autographed baseball, or game-used jock strap? If there is a market, why shouldn’t Jeter take advantage of it? Moreover, Jeter is retiring at age 40. He’s made a boatload of money over his career ($265 million, before taxes). What’s wrong with trying to capitalize on his last season before he retires? There are no guarantees in life, so I have no problem with Jeter’s capitalistic tendencies when it comes to merchandizing deals and sponsorships. Bottom line–The Yankees, Major League Baseball, and New York City will be sad to see Jeter go. He’s had a great run and has had a lot of positive impact in the lives of his fans and the public. I wish him well and hope to see him as Mayor of New York City in 2017. (I mean, come on — the current occupant of Gracie Mansion is a Red Sox fan).